PERICOM Semiconductor, represented by Braemac , has introduced a new family of five ultra-low on-resistance analog multiplexers and switches. These PI5AxxxxT products are housed in extremely small SOT-23 "SOTiny" packaging that address a wide range of space-constrained mobile and handheld computing applications. 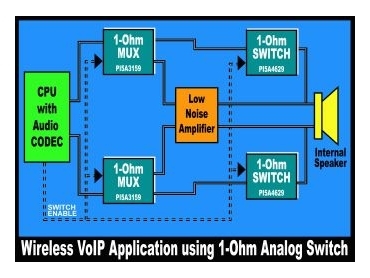 Offering 0.7-Ohm of On-Resistance, this low-voltage family of devices provides users with near-zero distortion, and high integrity signal routing for such end-products as portable phones, Global Positioning Systems, Portable Digital Assistants, and mobile computing systems. Pericom implements this new family of SPDT and SPST switches in low-power sub-micron CMOS technology, which helps extend the battery life of portable devices. These devices are also used as simple fixes to minute I/O oversights in ASIC or complex logic designs and often used in conjunction with Pericom SOTiny Gates. * Less than 1-Ohm of On-resistance for high integrity (low distortion) signal routing with (0.7-Ohms with a 5V supply; 1.4-Ohms with a 3V supply; and 0.05-Ohm resistance flatness. * Isolation, and unwanted signal rejection (off isolation: -57dB at 1MHz; crosstalk: -57dB at 1MHz). * Wide power supply operation (fully specified to operate on 1.8V to 5V supplies; low current drain: 1μA (max).